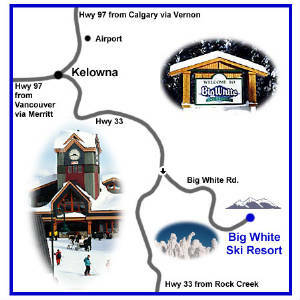 Big White ski resort is a short 45 minute drive from Kelowna International Airport. From Highway 97 in Kelowna take Highway 33 east for 26 km. Turn left onto the Big White Access Road. There are a number of well lit signs that identify this turn off. Follow the Big White Access Road for 28 km, past the Gem Lake Base Lodge through to the Main Welcome Signs. Continue along this road for another 2 km. Just past the entrance to the Happy Valley Base there will be a bridge overpass that is outlined in white lights. Just prior to the bridge turn left onto Whitehorse Lane. The driveway to BlackSmith Lodge is the first entrance way on the left. We are the third unit in the first group of town homes on your left. Our address is 310 Whitehorse Lane, Kelowna, B.C. Unit #3. The map below provides a visualization of the directions to Big White Ski Resort.